A native to southestern Europe and west Asia, used for forage and formerly in medicine and having seeds used in cooking. Needs full sun and rich soil. Seeds of this annual herb are used in pickling brines and marinades, as well as folk cures ranging from regulating insulin in diabetes to rickets. It was an ingredient in tonic medicines (including Lydia Pinkham’s) in the nineteenth century. 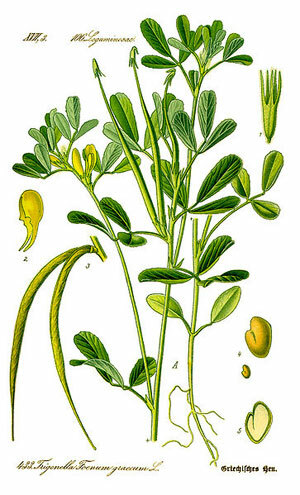 Mostly used in tea, fenugreek seeds can be sprouted like bean sprouts and used as a vegetable or a salad. The oil of fenugreek has a maple flavor and can be used for a true maple flavoring in cookies and syrups. Seed smells like celery but has a more bitter taste. Ground seed’s primary use is as an ingredient in curries. water, steep 15 minutes, strain) with meals. to 4 hours) to relieve sore throat. LiveStrong.com: How Safe Is Fenugreek? PubMed.gov: The plant extracts of Momordica charantia and Trigonella foenum-graecum have anti-oxidant and anti-hyperglycemic properties for cardiac tissue during diabetes mellitus. PubMed.gov: Safety and efficacy of galactogogues: substances that induce, maintain and increase breast milk production. PubMed.gov: The effect of fenugreek on the gene expression of arachidonic acid metabolizing enzymes. PubMed.gov: Anti-heartburn effects of a fenugreek fiber product. PubMed.gov: Effect of organic acids and plant extracts on Escherichia coli O157:H7, Listeria monocytogenes, and Salmonella Typhimurium in broth culture model and chicken meat systems. PubMed.gov: What do herbalists suggest to diabetic patients in order to improve glycemic control? Evaluation of scientific evidence and potential risks. PubMed.gov: In vitro estrogenic activities of fenugreek Trigonella foenum graecum seeds.